Robotic Palletising Cell's for Ready Meals | PAK Automation Ltd.
PAK Automation recently won a major contract with a Global Food Company who manufacture Ready Meals in a Plant in Dundalk in the Republic Of Ireland. The Project was awarded to Pak Automation Ltd to supply and install four complete systems amidst stiff competition but the small footprint of the systems as well as the highly reliable Kawasaki FD50 Palletising Robot provided the necessary solution for this demanding client. The systems are designed to run continuously and to pick up two shrink-wrapped bales of Ready meals at a time to cope with the required speed. The Robot tooling which was designed and built by Pak Automation Ltd was also a critical aspect of winning the project as the tooling needed to be able to cope with a variety of different pack sizes and also handling of layer sheets which are placed on every second layer. On the in feed to each cell a Bar code scanner is automatically checking the presence of the outer case bar code label and if no bar code is read or an incorrect read is detected the two packs are placed on a reject conveyor back out of the cell. 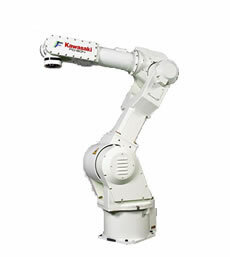 The Kawasaki FD50 is a high speed five axis palletising robot and has a maximum payload of 50Kg, it is controlled from the Kawasaki D Controller which comes with an on-board PLC (K Logic) which makes system integration more cost effective and avoids the need for additional costly PLC’s. 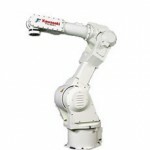 The reach of the robot is particularly impressive and enables systems to be designed with a small footprint without compromising on pallet build height. The cells were designed with installation in mind and were built as a complete skid mount assembly including the mandatory integrated safety guards. Safety of the systems was achieved by using SICK safety controller’s which are installed in the D Controller of the Robot. These palletising cells could be used for a variety of case and/or box sizes as well as shrink-wrapped bundles or any product that requires palletising on a pallet of 1200 x 1000 or 1200 x 800mm to a maximum pallet height of 1850mm.